Making Plant Medicine is about making herbal medicine. This is a modern medicine making book and formulary with its roots in original herbalism designed for every medicinal herb gardener to cultivate the full potential of the plant-human relationship. Richo Cech tells very good stories based on his experience as a global wanderer, herbalist and medicine maker. In the context of his lifelong love of gardening, he has procduced this long-awaited book that is original, amusing and absolutely useful. This section covers well over 100 herbs that are readily cultivated in North America. The listings include: conservation status, parts used, specific formulas, practical uses, dosages, contraindications and an overview of alternate species. Since the beginning, the garden has been a haven of good values, both physical and spiritual. The act of gardening provides a balm for every wound. May your medicine be of the garden, and may it be of benefit to all. Start reading Making Plant Medicine on your Kindle in under a minute. Richo Cech is an internationally recognized expert on the cultivation, processing and usage of medicinal plants. His early work in African archeology and ethnobotany coupled with a life-long interest in seed saving eventually materialized in an extensive collection of seeds. This collection became the basis for Horizon Herbs, a company dedicated to the worldwide dissemination of medicinal herb seeds. Richo serves on the executive board of United Plant Savers, an organization dedicated to the conservation of Native American medicinal plants. Richo strongly believes that organic cultivation of medicinal plants provides a necessary alternative to the harvest of precious plant resources from the wilds. Richo is the author of a popular series of pamphlets on the cultivation of medicinal herbs and a new book entitled "Making Plant Medicine." Horizon Herbs, PO Box 69, Williams, OR 97544-0069 (541) 846-6704. 5.0 out of 5 starsYou CAN make your own tinctures and Richo Cech will teach you how! I hate math sometimes, but Richo Cech's way of describing how to make tinctures in a consistent way made it very easy to understand. I needed that. Making tinctures at home is something I've done for years, and this book takes all the guesswork out of it. The writer's personal stories here are delightful to read and, obviously, he has a great love for plant medicines. Do you? Get the book and learn how to work with the green things! Ok, I'll try to keep this short, sweet, and to the point. This book is designed for the student who wants to take plant medicine to its limits. If you want to do weight based dosing, use calculations based to get the required dose, and have consistency in your medicine, then this book is most likely for you. 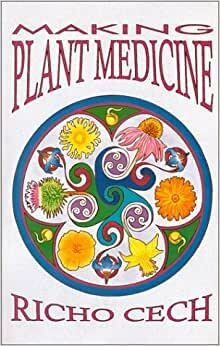 If you want the simplest method to get to make plant medicine this book has a whole chapter that gives you the quick and easy method (no math required). Cech has done a fantastic job of giving the reader both the easy and the complex. You decide which route you want to take (my opinion both have benefits). Half the book is formulas for specific plants. There really is a lot of information packed into this little book. Yes, there are other herbal medicine books that are designed specifically for the beginner. Yet, I haven't found a book that will allow you to do the fast and simple method while also giving you a book full of future growth in this field. This is a worthy herbal plant medicine book..
A really interesting read, and with plenty of helpful info for a beginner, I enjoyed it so much I'm into his other book The Medicinal Herb Grower, which is very informative and fun to read though not as helpful for my little garden in North Florida as I'd hoped. LOVE LOVE LOVE this book! As an herbalist I found that this is one of the books I refer to all the time and it has a beautiful story line as well. If you are new to herbs or experienced, it is an extremely helpful reference! My favorite herbal book hands down. It does not contain everything, but it contains a lot of what you need. This book is just what the title says. If you want to know how to preserve and make medicine out of herbs, this is the book for you. If one needs alcohol to best extract the herb, , Mr. Cech will tell what proportion of alcohol to water to use. Some herbs are better extracted by decoction (with 20% alcohol used to preserve) and some need vinegar or glycerine or a combination. This book explains what is best for over 100 herbs. Recommended.